Weighty Matters: Tapeworms - the new diet craze? Sadly this isn't an early April Fool's joke. Readers might not know it, but I collect antique weight loss doodads. 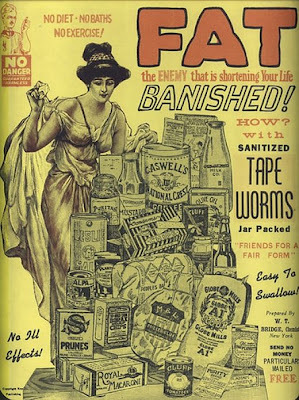 In my collection is an advertisement for tapeworms for weight loss from the turn of the century. Well apparently what's old becomes new again as dieters in Hong Kong are swallowing parasites in a bid to lose weight. I imagine soon we'll see raw chicken weight loss centres pop up all over the place -salmonella can certainly be lightening.